Returning from the local winery. We?re singin' in the rain. The creeks are filled again. P.S. This is really a heavy downpoour! Dressed in Renaissance garb, the Crones (a recorder quintet, composed of MPRO's own Stevie White, Laura Gonsalves, Sonja Wilcomer, Jean Ridley, and Anne Ng) presented a wonderful musical tour on Candlemas Eve, February 1, 2009 in Palo Alto at the Museum of American Heritage, where the current exhibit "Music to One?s Ears" (reviewed for Up Beat, October 2008) continues (by popular request) to March 29, 2009. The musical tour provided the full-house audience with an opportunity to hear how recorder music has evolved from the 13th to the 21st century. For the somber music of medieval times (500-1450) the audience was asked to try to visualize the context, perhaps a group of nuns playing music in an ancient abbey. But during the Renaissance (1450-1650) the music, all written specifically for the recorder with accompanying crumhorns and drum, was quite lively, often featuring music for dancing. After the Renaissance, recorders fell out of favor; thus the music written for the Baroque, Classical, and Romantic Periods (1650-1830+) needs to be rearranged for recorders. To illustrate music from each of these periods the Crones chose, respectively, Clarke's Trumpet Voluntary, Music for the Royal Fireworks by Handel, and La Donna e Mobile, from Rigoletto by Verdi (arranged by Hanneke van Proosdij). The last piece was particular appreciated by the enthusiastic audience. Examples of music from the 19th and 20th centuries included Shaker Melodies and Turkey in the Straw. 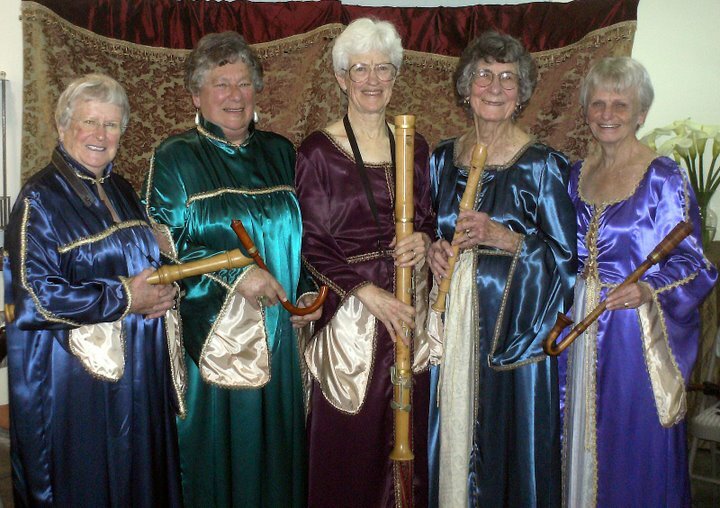 To illustrate recorder music for the 21st century, and to round out their performance, the Crones played music that was actually written for recorders by modern, contemporary composers, Glen Shannon and R.E. Wood. During the course of their performance, the Crones provided comment on the evolving music and the instrumentation being used. Afterwards, they answered questions from the audience. In summary, the Crones created a memorable afternoon and a great musical experience. *Candlemas is one of the oldest Christian liturgical events, celebrated forty days after the Nativity. In the U.S. and Canada, Candlemas has evolved into Groundhog Day, celebrated on the same date. A full explanation can be found in Wikipedia. Listed below is the music for the orchestra's next four meetings. Please note that great bass and contrabass recorders will be needed at all of the meetings and krummhorns will be needed on April 15. The meeting on April 15 will also include organ, viola da gamba and timpani. This is the only time prior to the dress rehearsal on June 5 that the orchestra will have the opportunity to rehearse the Boyce, Bach and Machaut with full forces, and I encourage all members of the orchestra to make every effort to attend that evening. MPRO hosted another stellar workshop on February 14th, held in the spacious parish hall of the Unitarian Universalist Church of Palo Alto. Vicki Boeckman came from her home in Seattle to direct "Heart and Soul - The Next Chapter". Vicki's energy, talent, knowledge and enthusiasm made this a wonderful day for everyone who attended. She is a firm believer in physical preparation for playing, and led the assembled recorder players in a number of warm-ups ? first stretching, and then breathing ? and took us through some body awareness exercises. She highly recommended two valuable books for musicians: A Soprano on her Head by Eloise Ristad, and The Perfect Wrong Note by William Westney, to help us with our approach to music making. Vicki brought four pieces for us to play, which doesn?t seem like very much for an all-day workshop, but after playing through Josquin's Ave Maria as a delicious warm-up, she delved into the other more challenging pieces that followed. We really "worked" a Passacaglia by Johann Christoph Pez (1664-1716), and by the time we?d played all the way through it a second time, it almost sounded like a new piece, since with her help, we could now understood the grand gestures implied by the music. She did the same for four movements from a suite of Handel's Water Music, which was a lot of fun to hear and play on recorders. The final piece she brought for us was MegaRONY by Pete Rose, which was a romp through four movements of bluesy chromatics and jazz rhythms, punctuated in the final movement by everyone playing percussion! OOPS! Your editor inadvertently left out the last paragraph of last month's front page article. In our MPRO, along with Bee Tee, are Margaret More, Grace Butler and LouAnn Hofmann plying their trade in the Orffan manner. Further details regarding the ORFF-SCHULWERK may. be obtained by plying anyone of them with your questions! The Choral Artists with The Whole Noyse Renaissance wind band present an unusual concert combining Early Music with new works written for mixed choir and Early instruments like recorders, sackbuts, cornetts and curtals. Featured is the world premiere of TedAllen's Marina, which explores a 16th Century Mexican historical figure, and is based on poetry by Bay Area poet Lucha Corpi. St. Mark's Lutheran Church, 1111 O?Farrell St.
St. Paul's Episcopal Church, 114 Montecito Ave.
St. Mark's Episcopal Church, 600 Colorado Ave. The program includes additional works by Brahms, Clemens, Croft, Distler, Lassus, Parker and others that explore the themes of Sound, Music, and Silence. This concert is sure to be a feast for the ears, and of interest to lovers of both Early Music and new works.